Many years ago, I played through the Quest for Glory series on my old family PC. Not so many years ago, I replayed them, plus the fifth installment, and reviewed them all for this site. My thoughts on the series included some highs and lows, with much of the latter being concentrated in the final title, Dragon Fire. Apparently Corey and Lori Cole, the lead designers for the Quest for Glory games, were as dissatisfied with the final product as I was. So after many years, two Kickstarter campaigns, and enough legal disputes to justify enshrining their lawyer and her dog into the Hall of Heroes, we are presented with a true sequel, both spiritually and canonically. Hero-U: Rogue to Redemption does not try to hide its connections to the Glory games, which go deeper than some name-dropping and in-jokes. Previous characters of importance are memorialized as statues throughout the old castle that houses the Hero University, and a few characters have direct canon connections to earlier games. More interesting is that Hero-U treats the Rogue quest line of the Glory games as its primary canon, and even continues the Blackbird storyline. Our sort-of-hero of the hour is Shawn O’Conner, redheaded ne’er-do-well from the city of Calignia on the isle of Sardonia. On his first foray into thievery, he’s caught by a mysterious stranger and convinced that what the man offers is preferable to the jail time he’s about to get. This is how Shawn becomes the sixth and final member of Hero-U’s unofficial Rogues classroom, a section of the curriculum so secret that they have to go undercover in their own school as part of their training. As far as the other students are concerned, they are Bard students who nearly washed out of the program and are getting a second chance. Only the main faculty is aware of the class’s dual nature, and not all of them are happy about it. Rule #6 of Rogues Class: Don’t Get Caught. 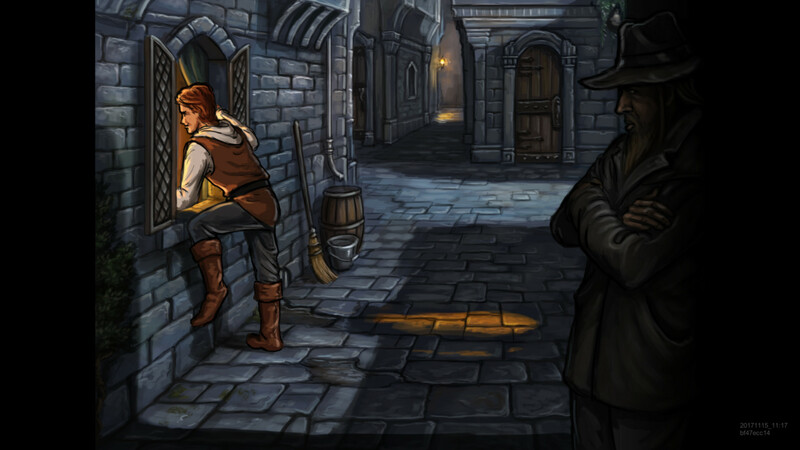 As befits an adventure-RPG, the story is both central and oddly avoidable. Time marches along the set calendar of the school year, with certain story arcs opening or closing according to the date. However, since it all takes place at a school for heroes (even somewhat disreputable, roguish ones), it’s possible for all the secondary story arcs to be completed without Shawn’s assistance, as classmates take it upon themselves to rid the school of pests, search for treasure, or lead rescue attempts (unfortunately unsuccessful in that last example). All the major characters are well-written, with clear voices that set their personalities, and the shenanigans that ensue tend to grow naturally from the students’ personal goals. Shawn may be the protagonist of the game, but his classmates are very much the heroes of their own stories as well. Much like its predecessors, Hero-U does not use the standard experience-level scheme. Instead, all ability and skill scores are raised through good, dishonest work, either individually or paired depending on the activity chosen. For example, it’s a good idea to hit the barbells early on to raise Fitness, and thus health and stamina, though regular old exercise through fighting may raise Fitness, Combat, Defense, or Throwing, depending on how the player goes about it. Likewise, it pays to do one’s homework every evening before bed, or to practice all of one’s roguish skills whenever possible: listening at doors, tossing darts, sneaking around the Dean so he doesn’t notice a lack of school uniform, or simply picking every lock that presents itself. Time management is an important skill for the player, as Hero-U strongly resembles the Japanese school-sim style of RPG in many respects. Story characters change location depending on the time of day, and at the start adventuring is limited to evenings only. Dinner happens between set hours, and a hungry rogue is an ineffective rogue, but sometimes it’s necessary to cut some corners timewise in order to get important things done. At certain points in the school year, Shawn can choose elective courses, allowing him to pick up useful tricks to complement his usual skills, but at the cost of some precious afternoon training time. It’s all up to the player to prioritize and plan, as Shawn would much rather sleep late whenever possible. He who sneaks and runs away, lives to sneak another day. 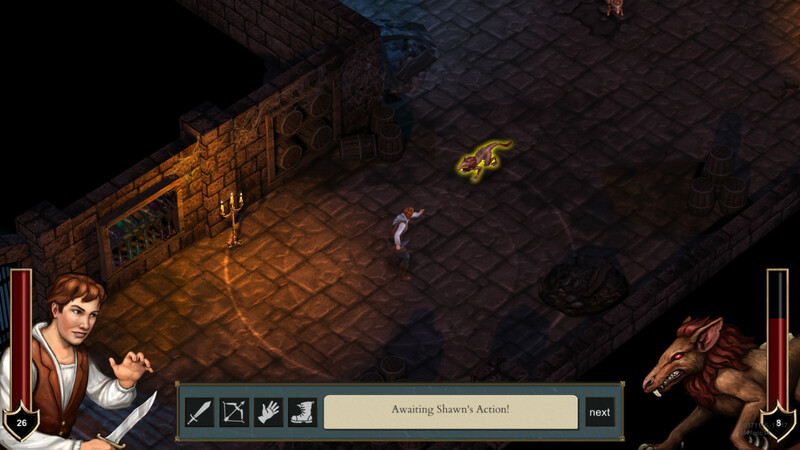 It wouldn’t be an RPG without some dungeons, and Hero-U provides. Aside from the school itself, there are four areas beneath it to explore, scavenge, and rid of monsters. They’re not necessarily large areas, but they were designed with adventure-style exploration in mind, with many hidden secrets, skill-gating, and plot elements to find. With the exception of certain major encounters, defeat in battle sends Shawn back to the infirmary for some patching up — and the Bad Ending art for those few encounters is worth seeing at least once, just for giggles. Hero-U features an all-new combat system for the series, which is good, and it seamlessly incorporates the roguish sensibilities of the main characters, which is better. While it is turn-based and tactical in nature, the player may take advantage of enemies not noticing a sneaky hero, effectively allowing Shawn to creep around and avoid enemies, snipe them from a distance with throwing knives, or simply stalk them for a close-in kill from behind. Given how easy it is to overcome a rogue’s defenses when the enemies gang up on him, it makes sense to allow options to cut and run, lay down traps, glue, or snare runes, or simply poison as many targets as possible. At least one of the game’s bosses is best defeated by retreating, reporting the thing to the school’s resident Paladin, and letting her do the dirty work. While perhaps counter-intuitive to someone used to the simple and direct confrontations of many games, having many varied options jives well both with Hero-U‘s tone and its roots in the adventure genre. The game’s origins in the point-and-click adventure genre are evident throughout, with most controls being through the mouse. There are some quick key functions to toggle walking speed and other things, but the majority of interaction is through little menus which pop up when something is clicked on-screen. Gone are the individual action cursors of the earlier Glory games, and with them a measure of the puzzlement of figuring out which action to use on what item, but there are still plenty of options available. At times it can be frustrating when the player figures out the solution to a problem before the game’s actually ready to let it be solved, and there’s a lot less item-on-item manipulation, so Hero-U is certainly more RPG than adventure game at this point. Still, the game allows multiple paths and tricks through its secondary plots, and there’s relatively little hand-holding. Graphically, the game hearkens back to its roots even as it makes use of modern three-dimensional modeling, getting the better of both worlds with richly detailed backdrops full of little things to examine, as well as character models that are reasonably well articulated. In a perfect world there would have been even finer detail on the various motions of tool use, but as it is it’s easy to tell what anyone is doing at a glance. Character portraits are more old-school, drawn instead of rendered and with enough variations for everyone to have a strong range of emotions to draw from. 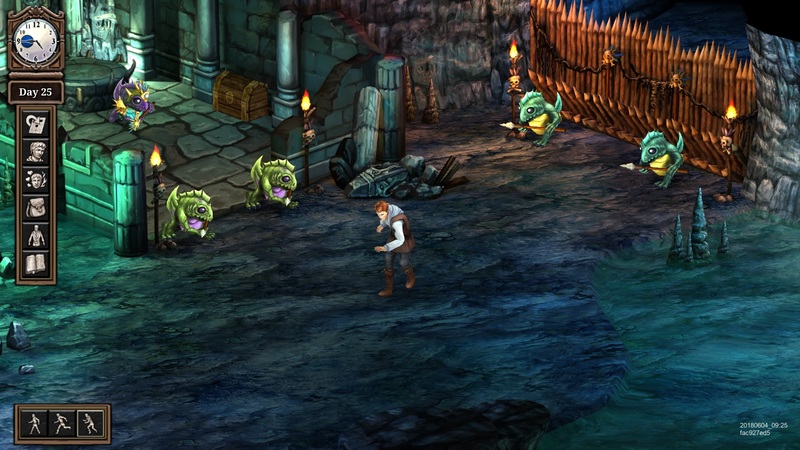 Various scenes have splash art, including all the different ways for Shawn to get eaten by monsters. The musical score also sticks to the tradition of the older Sierra games by focusing more on the atmosphere of the school and its environs than with booming, scene-stealing numbers — though with a few exceptions. Any scene involving a Kraken and a cadre of zombie pirates deserves the coolest music the developers can muster. Composer Ryan Grogan did a good job on this one, and the boss battles in particular, with an interesting mix of folk, classical, and heavy rocking elements. Unfortunately, there are some spots where it was obvious that the Coles couldn’t put everything they wanted into this work of love. Many reasons are given to help explain the fact that all but one of the school’s non-rogue students are seen only in splash art, and the relative emptiness of the school halls is a little weird at times. There’s at least one dropped plot thread, and a few others which don’t necessarily end to the player’s satisfaction. Finally, the game could have used some way of keeping track of which characters were where, during the day at least. In all honesty, I don’t keep up with the Kickstarter website, and so I had no idea this game even existed until right before its official release. But if you’d asked me a couple years ago, after finishing Dragon Fire, what I’d like to see done with a reboot of the series concept, a lot of what I might say would resemble this game here. Hero-U: Rogue to Redemption couldn’t get everything absolutely perfect, but no game ever really does. Instead, it got a whole lot of things just right, which was enough to counterbalance most issues. I am looking forward to seeing what the Coles do with their next endeavor into this world. Lives up to the Quest for Glory legacy. Manages a good cast of characters. Stealth and combat elements combined well. Character model animations a little lacking. Time management takes some time to get used to.